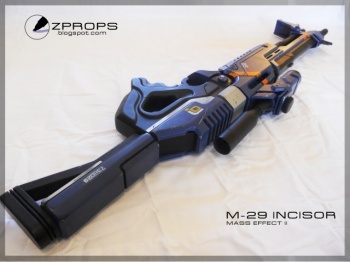 Of the scores of replica Mass Effect weaponry you see today, Zander Brandt's M-29 Incisor rifle will undoubtedly be the best. Brandt, a prop designer whose name would be entirely appropriate for a suave international jewel thief, has been working on this project for a while and the end result is rather impressive. For those of you not familiar with the M-29, have a look at the original courtesy the Mass Effect Wiki. See that image of the rifle? That's the gun as it appeared in Mass Effect. Now compare that to Zander's finished replica. Notice Brandt's faux weathering? The distressed serial number? The topography of both the grip and the buttstock? It's spot-on, is what I'm saying here. Granted, it's unlikely this M-29 could headshot a Geth or club a Krogan to death, but now that I think of it, you could probably murder a Salarian with it. Those guys seem kinda fragile. Being one of those 'net-friendly prop makers, Brandt documented the gun's entire creation process on his website. Part 1 covers the heavy lifting, while Part 2 is more focused on the minute aesthetic details. Combined, the two entries serve as proof of his skill, and a reminder that none of you have the ability to put something like this together. Which, by the way, is good news for Brandt. This rifle, like the majority of his props, is a commission piece created for a devoted fan of the game. Sadly, there's no word on how much Brandt charges for this kind of work, though I wouldn't expect it to be cheap.